Meanwhile, break off tough ends of asparagus as far down as stalks snap easily. Wash asparagus; cut into 1-inch pieces. In 12-inch nonstick skillet, heat oil over medium-high heat. Add chicken; cook 2 minutes, stirring occasionally. Stir in asparagus, mushrooms and garlic. Cook 6 to 8 minutes, stirring occasionally, until chicken is no longer pink in center and vegetables are tender. In small bowl, gradually stir broth into cornstarch. Stir in onions and basil. Stir cornstarch mixture into chicken mixture. Cook and stir 1 to 2 minutes or until thickened and bubbly. Season with salt. Toss with pasta. Sprinkle with cheese. 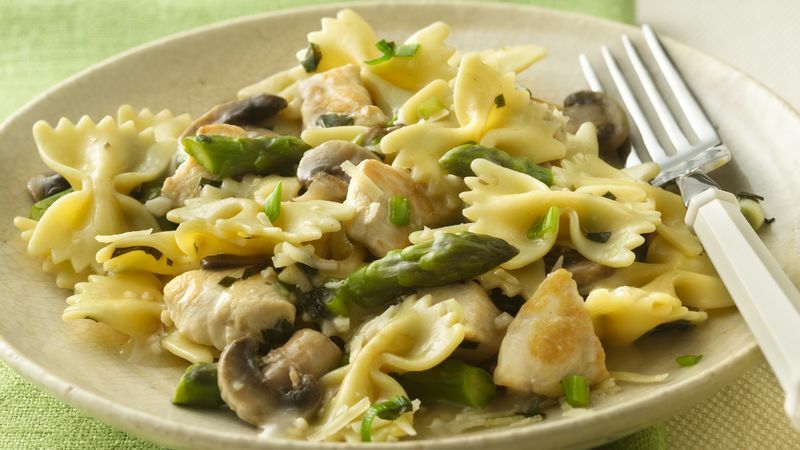 This light pasta entrée pairs nicely with a glass of crisp white wine such as Pinot Grigio or Sauvignon Blanc.